Help kids discover the faith-building life-changing truths tucked into 13 of Jesus' surprising sayings. They will begin to understand what it means to start fishing for people love the meanies they know why they would want to be last and others. And along the way kids will see that Jesus changes everything—for those who choose to follow Him. If you want kids to do God's Word and not just hear it—you're in exactly the right place. Each session focuses on one key Bible truth—kids will discover it think about it talk about it pray about it and apply what they learn. You'll drive that point home through Bible exploration fun discussions giggle-worthy games and oh-wow activities that engage kids in multiple ways. Perfect for any children's ministry program—Sunday school children's church and more! Mikal Keefer has published more than 20 books and is a frequent contributor to Group Publishing curriculum. He's an active volunteer leader in children's ministry at Church of the Good Shepherd in Loveland Colorado. Mikal who is married and the father of two children is the author of all six titles in this series. 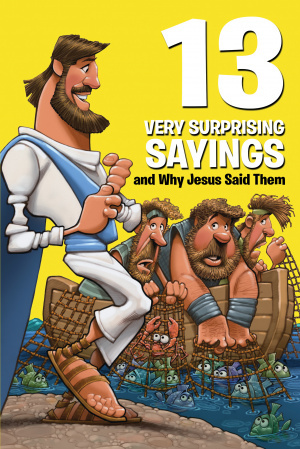 13 Very Surprising Sayings and Why Jesus Said them by Mikal Keefer was published by David C Cook in May 2018 and is our 63035th best seller. The ISBN for 13 Very Surprising Sayings and Why Jesus Said them is 9781434712554. Be the first to review 13 Very Surprising Sayings and Why Jesus Said them! Got a question? No problem! Just click here to ask us about 13 Very Surprising Sayings and Why Jesus Said them.